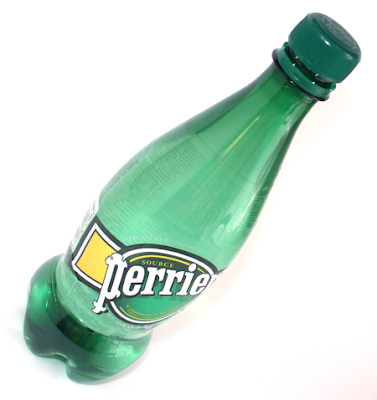 Perrier is an international mineral water brand like water brands like Vitel and Evian. However when I saw it for the first time in the Dutch supermarkets I thought it was a bottle of beer or a wine placed on the wrong shelves. The bottle totally did not blend in or fit well between the non achohol beverages. Actually the design got allot of resemblems of a beer bottle. The logo, label and green bottle made it look more home between the alchohol beverages then the mineral waters. For people who don't know the taste of Perrier it is a mineral carbonated water, so it taste like nothing but got allot of bubblies. I doubt that anyone would buy this in the Netherlands because it have a major competition called SPA, which is the main and biggest bottled water company in the Netherlands. Plus there are really allot of mineral water brand in the Netherlands not however most of them don't aim for carbonated because the Dutch audience only have a small target group that like to drink carbonated water. From what I think would be better if they do a redesign of the style. At the moment it kind of trying to present it self for the male audience and a carbonated mineral water, by imposing as bottle of beer. However the audience that drink carbonated water are mostly female and more drink it as a cool refresment. This bottle would been better if the plastic was totally transparent without a shade or if should use a blue or turquoise color instead of this shade of green.